Wolfsburg - Three years and just over eight months on from their last appearance on the international stage, VfL Wolfsburg appear on course to qualify for Europe once again. Long before the legendary second-half-of-the-season surge that saw them clinch the 2009 Bundesliga title against all odds, Wolfsburg had dreamed of competing in continental competition on a regular basis. Up until now though, that’s all it’s been - a dream. Considering the talent the Wolves have at their disposal, their rise up the league table is more a realisation of their capabilities than a surprise. Wolfsburg have struggled to live up to expectations in recent years and even flirted with relegation from the Bundesliga in 2010/11. This year, however, the side from Lower Saxony seem ready to capitalise on the potential within the club. With seven fully-fledged internationals and nine different nationalities represented in his squad, head coach Dieter Hecking, aided by sporting director Klaus Allofs’ work in the transfer market, has built a side ready to challenge for European qualification. "Right now things are looking really good," explained the 49-year-old. "Everything is coming together, but we’ve got to make sure that we don’t start to dream too much." Indeed, after a slow and somewhat shaky start to the season, Wolfsburg's European bid is finally starting to take shape, although playmaker is fully aware that every member of the squad must "keep performing to their full potential" if their ambitions are to be realised. Unbeaten in eight games - a run of results that included the 2-1 scalp of title hopefuls Borussia Dortmund - Wolfsburg now sit just three points behind the third-placed Schwarz-Gelben, having collected more points than ever before in the first half of a campaign. "We’re on the right track in terms of our development. The team has really gelled," admitted club captain Diego Benaglio, whose sentiments were echoed by defender Robin Knoche. "The team have become a tighter unit," explained the 21-year-old, who alongside fellow youngster Ricardo Rodriguez is beginning to emerge as a key figure in the Wolves backline. "We all fight for each other and that sets us apart." Many had originally questioned whether Hecking had the tactical aptitude and strength of character to cope with the daily trials and tribulations of a club competing for European qualification. However, the former 1. FC Nürnberg boss, though conservative in nature, has proved a perfect fit in Wolfsburg, where his brand of football has added discipline to a backline that has lacked cohesion in recent seasons. Only FC Bayern München (eight) and Borussia Dortmund (15) have conceded fewer goals than the Wolves (17) this season - a marked improvement on the previous campaign, in which they let in an average of just over 1.5 goals per game. The battle is far from over, however, as Hecking pointed out in November. "We’re currently in the midst of a group of seven or eight teams that could finish in fourth." 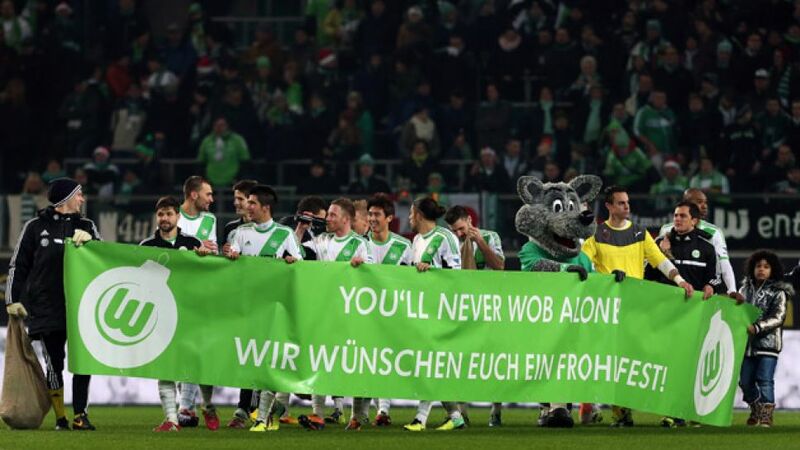 In their final game of 2013 against Borussia Mönchengladbach, Wolfsburg have a chance to underline their ambitions. Only time will tell if the Wolves will wake up in a cold sweat, but a win would move them a small step closer to making their European dream a reality. "We’re not under an intense amount of pressure at the moment," commented Allofs. "The key is making the most of that."